Return to top of page · Post #: 1 · Written at 10:11:17 AM on 8 February 2019. I wonder if anyone can point me in the right direction on this. I've got what appears to be an updated version of the R/C bridge in the December 1954 issue of RTV&H. I have managed to find a copy of that article, but I'd like to figure out which edition has the updated version of the R/C bridge in it. It does look as if it is an "official" update rather than somebody going and doing their own thing -- the front panel with all the printing/lettering on it doesn't seem to be "home made", if that makes sense. Unlike the original one, mine uses a 12AX7 for the amplifier and has a gain control. It also has an extra switch for choosing between testing the value or tolerance. I have traced and drawn out most of the circuit, but it's a bit of a dog's breakfast inside the thing and I'd like to try to find the original article to verify that I'm right with what I've traced out so far. The circuit descriptions are helpful as well -- I haven't got as strong an understanding of valve equipment as I do with transistorised stuff. As-is I'm able to get it back in good shape and running again, but it's always nice to have these things if they're available. Return to top of page · Post #: 2 · Written at 10:20:17 AM on 8 February 2019. Silicon chip market the CD with all the RHTV magazines scanned onto it. Check out any issue of SC. You will have to trawl through that CD manually to find the articles. It is a great resource for any vintage radio/electronics hobbyist. Return to top of page · Post #: 3 · Written at 2:20:18 PM on 8 February 2019. 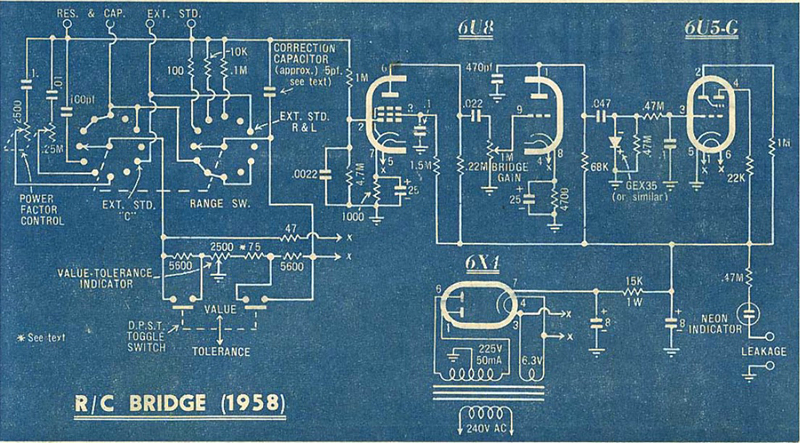 The September 1958 issue describes the updated R/C bridge, which includes the gain control and a value / tolerance switch. However it uses a 6U8 triode pentode, but I can see that a twin triode could do the same job. Otherwise, I think this is the one you have. The whole article runs over several pages, too much for here, but I can compile it and email it to you. Circuit diagram to Brad for inclusion. Return to top of page · Post #: 4 · Written at 3:05:10 PM on 8 February 2019. Found a copy of the 1958 issue. Circuit diagram almost spot on matches what I traced out in mine aside from the different valve being used and a few minor modifications. Thanks! Whoever built the one I have has added a small light bulb in series between the centre tap of the transformer and the chassis earth. Any idea why they might have done this? The only reason I can think is that it's some type of current limiting to be gentle on the valves when it's first turned on, but honestly have no idea as I've never seen it before. Return to top of page · Post #: 5 · Written at 4:14:57 PM on 8 February 2019. The December 1954 article (6X4, 6N8, 6U5) says it's a "new dress" for the original described in December 1948 therein called the Standard RC Bridge (6X5, 6B6, 8U5/6G5). Return to top of page · Post #: 6 · Written at 6:53:50 PM on 12 February 2019. Photo uploaded to Post 3. Return to top of page · Post #: 7 · Written at 6:00:54 AM on 15 February 2019. The globe would actually act as a "Hot wire" Barretter, It may have also been an attempt at a cheap regulator and surge limiter for the 6X5. AWA often put a 1/2 watt resistor in series with the plates of 6X5. It works by changing the self bias as all cathode current goes through it. It is a sort of back bias, but in order to avoid hum which may interfere with its performance? The first filter cap Neg. would need to be on the CT. The leakage tester is more for Non Polarised caps, & is pretty much a copy of that of the Circa 1938 Paton VCT. Basically a non polarised cap should not pass DC (Electrolytic caps do). The Neon should blink & then extinguish as the cap charges. The magnitude of the "glow" from the Neon is an indication of just how failed it is. In my book if an NP cap leaks to any degree, its a fail. To really get even better regulation, both "B" and "A" should be regulated. Some top line Signal Generators & such, do that. Return to top of page · Post #: 8 · Written at 9:41:25 AM on 31 March 2019. The small light bulb would be passing the 100Hz peaky current pulses charging the 8μF cap input filter. Given the 225V secondary and its effective series resistance, and 6X4 anode resistance, I doubt the bulb filament resistance would have noticeably changed the droop dominated by the secondary winding and anode resistances. I would think its ability to act as a poor mans fuse, and possibly as a faultfinding indicator would be its main purposes. Perhaps worthy of adding in a 1N4007 with each 6X4 anode to make the unit a bit more bulletproof for another few decades.